The spring of 1978, Marky joined the Ramones. In a matter of weeks he was in the studio recording his first album with The Ramones entitled, “Road to Ruin”, which features one of the biggest Ramones songs “I Wanna Be Sedated”. The following year the Ramones filmed the cult classic “Rock ’n‘ Roll High School”. Later that year, they joined forces with producer legend, Phil Spector to record “End Of The Century”. In 2000, Marky reunited with long time friend Joey Ramone for Joey’s solo effort “Don’t Worry About Me”. In 2001, Marky along with his former band mates (Johnny, Dee Dee and Tommy), were inducted into the Rock ‚N‘ Roll Hall of Fame. That same year, U2’s Bono presented the Ramones with the MTV’s Lifetime Achievement Award. 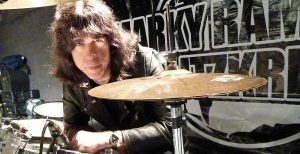 With no signs of slowing down, Marky continues to tour the world with his band, Marky Ramone’s Blitzkrieg, which includes friend Michale Graves (ex-Misfits) on vocals. In early 2010, they released their first single “When We Were Angles” with former member of Sheer Terror, Mark Neuman, playing bass and guitar.